And now here we are, 2014. And everything I’ve said for the past seven years remains true. And there is so much more too. Pre-kids, Braydon and I spent a lot of time at my grandparents’ cottage on Winnipesaukee. The period of time when we were losing my grandparents (my grandfather’s death, my grandmother’s Alzheimers) coincided exactly with the same period of time that I was forming the foundation of my adult life. I was in my twenties, in graduate school, living in Boston, duking it out with Braydon to try to create a true-to-ourselves relationship that would be lifetime-lasting. 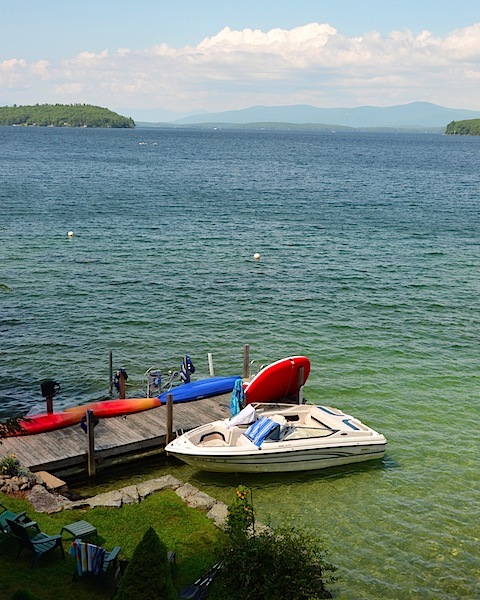 The cottage at Lake Winnipesaukee became a place where we spent many a summer long-weekend getting away from two grueling doctoral programs and multiple grimy steaming-hot urban Augusts. At The Cottage we would plant plants and water them, we would mow the lawn, we would scrub the place and fill the motorboat’s gas tank and fix little things here and there — but mostly, we simply got to enjoy all of the pleasures of The Cottage. The crystal clear water of the lake, the motorboat and its endless adventures, The Cottage with its generations of storied history. We simply received the gifts of a beautiful place that became a refuge for us. Mostly though, in our twenties, Braydon and I would sit at the end of the dock and talk. Mostly we were figuring out our past, figuring out our present, and figuring out our future. We learned so much about who we were and what we were becoming and who we wanted to be through those conversations at the end of that dock. What would have become of us if we hadn’t had the gift of that place to sit? It is a profound privilege that cannot be understated. This was not something we earned or deserved. We didn’t work hard to get it, nor do anything special to receive it. It was something given to us with virtually no strings attached, something precious, and something we were always, always, always grateful for. All we had to do was respect the place and treat it with reverence — which we always did. There was history before that too. 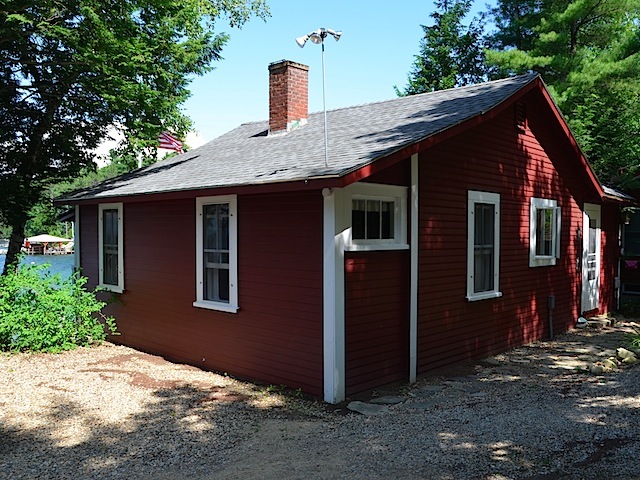 The cottage had been an important part of my individual trajectory. For my college years it was an escape — a place where I could run to and hide, thanks to my grandparents who seemed to somehow know what it meant to me and always made it available to me. Often I went there when I was needing solace and healing. I’d go there to retreat from the world and lick my wounds and recover. I don’t know why or how, but The Cottage always reminded me of who I was and wanted to become, and it always made me feel like I couldn’t give up. I always felt healed there and I’ve always been profoundly grateful for that. What would have happened if I hadn’t had that place to go to and hide? As a teenager I can remember strapping my little sunfish sailboat — my most prized and valued possession in the world — onto a car and driving it over to the cottage. My Popop would help me get it off the car and into the water at Winnipesaukee (which was no small feat given the rocky ledges and the steep decline down to the lake). 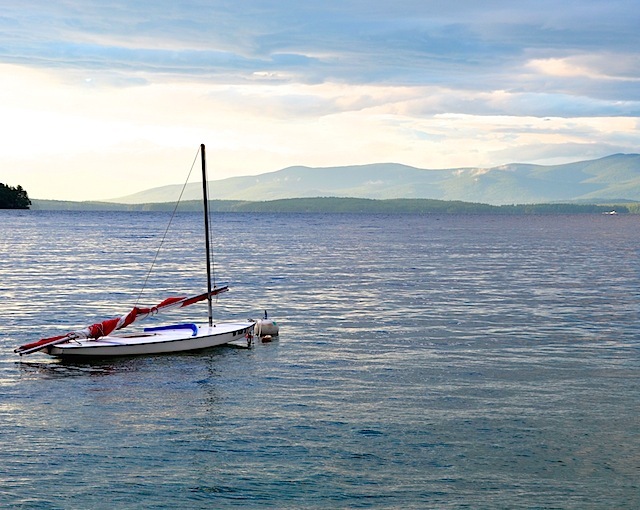 I spent most of my time on that sailboat at the lake where I grew up — Lake Ossipee — but I have vivid memories of sailing it at Winnipesaukee too. Winnipesaukee felt so huge and vast and unknown in comparison to Ossipee where I knew every single nook and cranny of that much smaller lake. As I think back on it now I wonder how much that had an impact on me? It seems so symbolic to me now: the bobbing along on my most beloved boat, all by myself, pushing the boundaries of my own horizons and expanding my known. My grandfather would sit out front trying to keep an eye on me with his binoculars. But I was often out of sight, hidden by the islands or the jutting peninsulas on either side of The Cottage. I never liked to sail on the open lake as much as I loved to explore the coves and inlets. It made my Popop so nervous, but he always let me do it. In fact, to be honest, I felt encouraged by him. 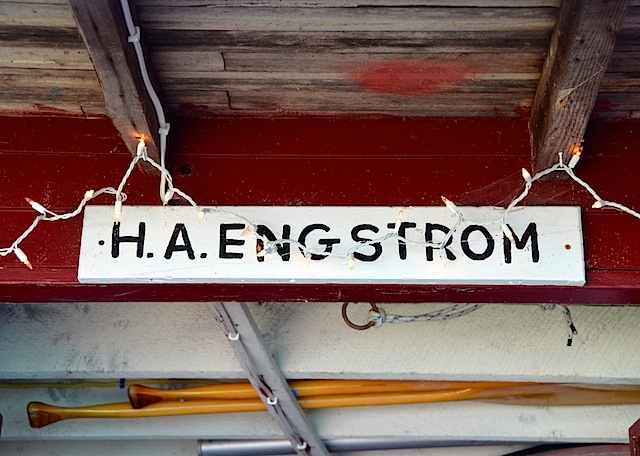 When I’d return to the dock my Nana would always have Swedish Ida Kaka cookies waiting for me. Those cookies are always thought of as Christmas cookies, but instead of rolling them in green and red colored sugar, in the summer she’d give them to me rolled in pink sugar. Still, I always felt a little strange eating them in flip-flops in summer. But she knew they were my favorite, so she’d make them in The Cottage’s little kitchen, and demand that I go home with the whole batch packaged up in a tin. And so, at Christmastime, whenever I eat them, in a strange twist, although they are indeed Christmas cookies, I always think of summertime at the Cottage. I have strong memories of The Cottage from my childhood too. As a young girl I learned to waterski there with my sister Stina and our cousins Karen and Eric. My grandfather would drive the boat so patiently and my parents and my aunt and uncle would all cheer from the shore, the back of the boat, or the lake. I remember my mom in the water, well past her waist, cheering for us. Now I know she stayed there because one of us would inevitably fall, and fall again, and it was easier to just stay in the water than to keep getting in and out to help us. I loved waterskiing. I always knew it was a treat. Not something for the everyday, and not something that most people could ever enjoy. Waterskiing was a privilege. I remember being profoundly grateful even at a very young age. My mom and her sister learned to waterski there too. The Cottage was passed down to their aunt and their mother from my great-grandparents, who had built it as a replica of the country cottages in their homeland of Sweden. I’ve heard so many stories from my mom of her childhood and teenage summers at The Lake. And I remember my Nana telling me her stories as well. And my aunt, and my great-aunt. The summer I was 28 years old, Braydon proposed to me one morning at the end of the dock at The Cottage. Believe it or not, although it was a marriage proposal, at the center of our conversation that day was the gratefulness we both felt for this place we loved so much and what it represented to us. It, for us, represented a history and lineage of one branch of our entwining family trees; it represented privilege and power; and it represented the idea of making the most of what you’ve been given. This idea is at the core of our lives to this day. The idea of receiving what you’ve been given with mindfulness and gratefulness, being aware of it, and making the very most of it. For us, making the most of it involves using every gift we have — material, intellectual, spiritual, and otherwise — to do good in the world. For us, it means maximizing advantage to contribute to the common good; using what we have fully and wholly; empowering others with our power; discerning our capacities and doing the most with what we have. To squander one’s gifts, particularly the gifts of privilege and power and — importantly — opportunity, seems, to me, to be the worst possible wrongdoing. That — at the essence — is how we try to live our lives. This post is getting philosophical, and I don’t want to go on and on and on about it. But I’m putting myself out there here and I’m tired of holding back. For me now, at age 42, the essence is becoming the everything. For me now, at age 42, The Cottage is still symbolically representative of all of this when I look at it in the best possible light. It is, of course, all much more complex than this. The Cottage too represents decades and generations of family tensions and old ragged histories that spin into today. If you look closely you see the rot in the wood, the rust on the metal, the wear and tear of five generations of use. I don’t know how much longer it can hold out. Which only makes me that much more grateful for it. I wish that my great-grandparents and my grandparents could read this so that they’d know how grateful I am. I am glad that, if they choose to, my parents and my aunt and uncle can read it now. And maybe someday my children and my niece and nephew will read it too. It is hard to talk about the depth of things at family holidays or birthdays or funerals. 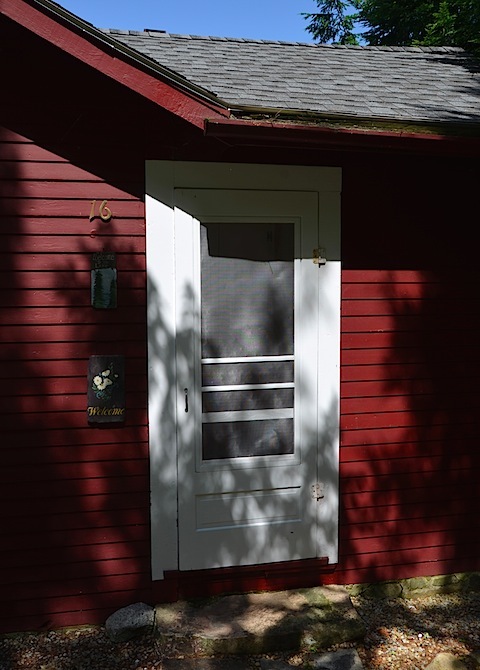 That, I think, is one of the reasons I write about things like The Cottage here… because it helps me understand my own thoughts and share them with others if they choose to read them. The Cottage today is a whole other era — a new evolution different from each of my own stages and phases with it as I’ve described them above. Today, for the one week a year in August that I spend there, The Cottage has become mainly about my own kids — the youngest generation in our Engstrom-Johnson-family-lineage. I’m never there alone like I used to almost always be when I’d be there in my teens and twenties. Now, for me, it has swung back to something resembling what it was for me as a little girl: a family cottage on a beautiful lake where we come together as grandparents and parents and grandchildren for fun in the summer. Now, for one week a year, it is all-action all-the-time. It is all about the kids. It is the motorboat, and it is waterskiing and tubing, it is eating and swimming and kayaking and — re-introduced in 2014, my long-lost-love: yay! sailboating! — and I am truly, deeply, grateful for it all. I’m certain, too, because I know them well, and because I make sure they understand the depths of it, that my own kids are grateful. The 5th generation is grateful. The Cottage has been shared once again. 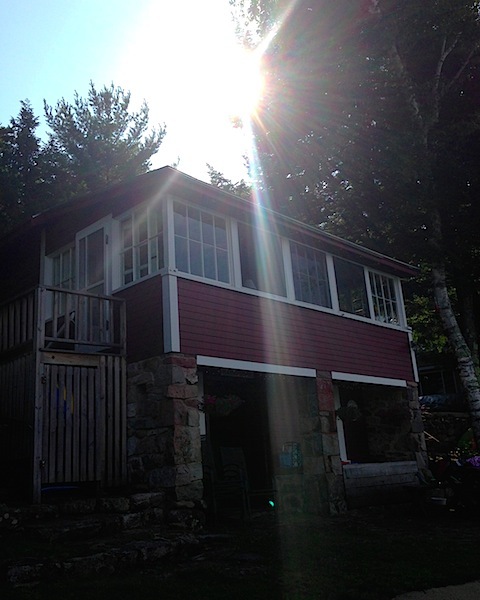 And while so much changes over time, and while each of life’s stages morphs and evolves, the one thing that I know for sure has remained consistent about my experience of The Cottage is my gratefulness. Thank you so much, Heather, for sharing this history and philosophy of yours. There is so much beauty in them both. We have a special place like this, it’s no wi-fi and home-cooked food and a closet full of wetsuits and love. I just called my mum to thank her for making it our special place, thanks for the reminder Heather. Thank you for sharing a bit of your history with us. Out of all your travel posts (and really, I enjoy them ALL! ), I think the NH ones are my favorite – it really embodies everything a true FAMILY vacation should be. And I burst out laughing at the pictures of the 4-person raft! So much fun! Wonderful post Heather – really poignant and thank you for sharing your individual trajectory, the history and significance of this cottage publicly here- a wonderful record to have for yourself and your family.